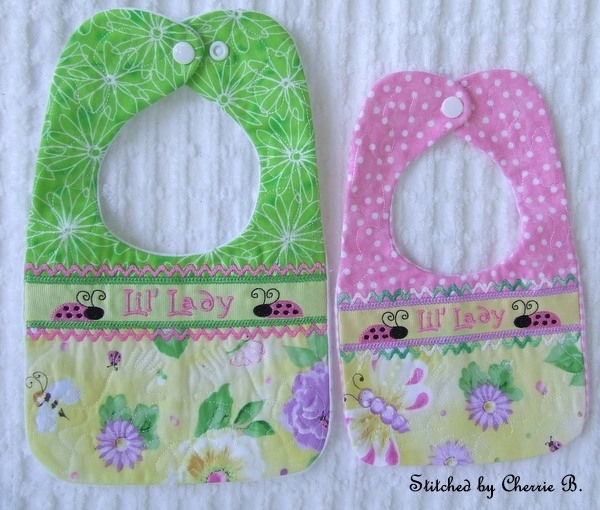 This in the hoop drool bib is fast and fun to make. Combine it with some of our other in the hoop baby designs for a one of a kind baby shower gift. This bib comes in two sizes and two versions. This will allow you to insert a child’s name, saying or design of your own choosing. 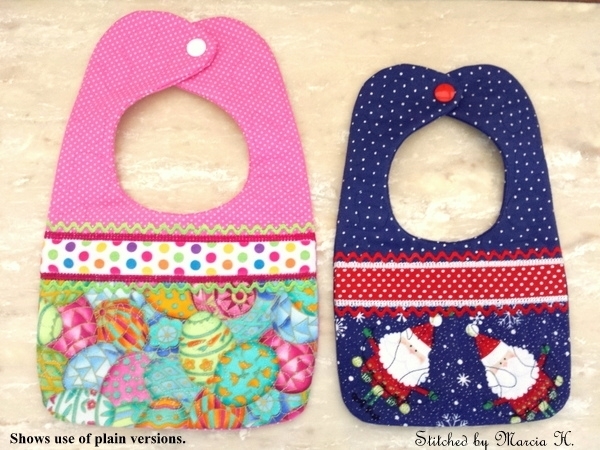 The background of the bibs is motif quilted (children’s hands intertwined with hearts) and the border ribbon is inserted during the embroidery process.\ Closure is accomplished by applying snaps or machine sewing Velcro to the bib. The bib is turned right side out through an opening in the back lining. That opening gets fused shut or can be stitched closed by hand. All bibs come with placement guidelines for snaps; the 7x11 version comes with two guidelines to make adjusting of bib to different ages and neck sizes easier. All done in one hooping. 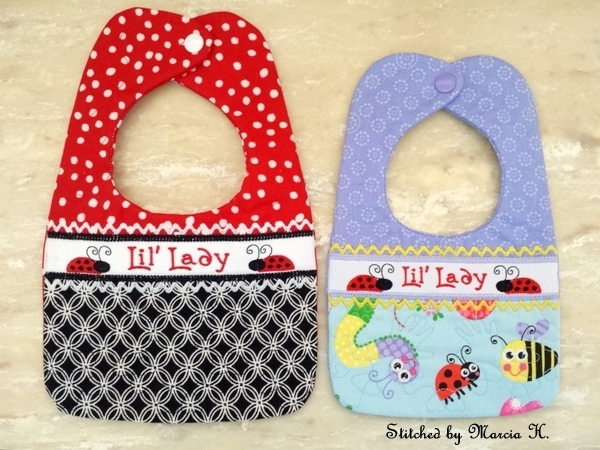 Both the plain and decorated bibs come in the 6x10 and 7x11 sizes. There are a total of 4 stitch files in this set. Please check your hoop sizes carefully. This in the hoop drool bib is fast and fun to make. Combine it with some of our other in the hoop baby designs for a one of a kind baby shower gift. This bib comes in two sizes and two versions. This will allow you to insert a child’s name, saying or design of your own choosing. 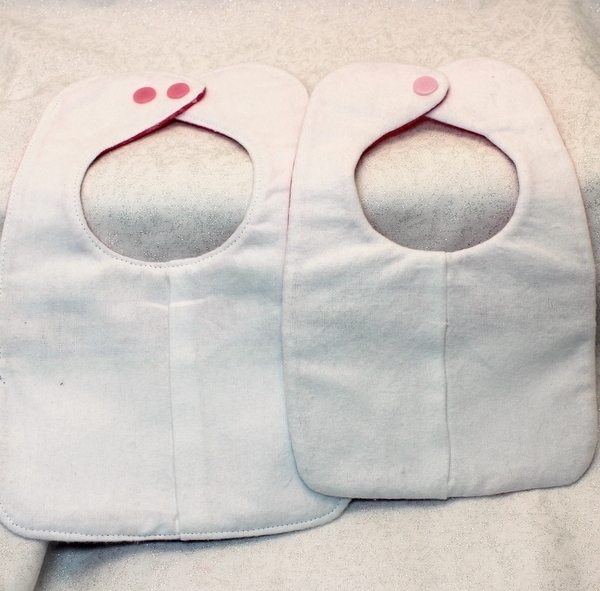 Closure is accomplished by applying snaps or machine sewing Velcro to the bib. The bib is turned right side out through an opening in the back lining. That opening gets fused shut or can be stitched closed by hand. All bibs come with placement guidelines for snaps; the 7x11 version comes with two guidelines to make adjusting of bib to different ages and neck sizes easier. All done in one hooping. 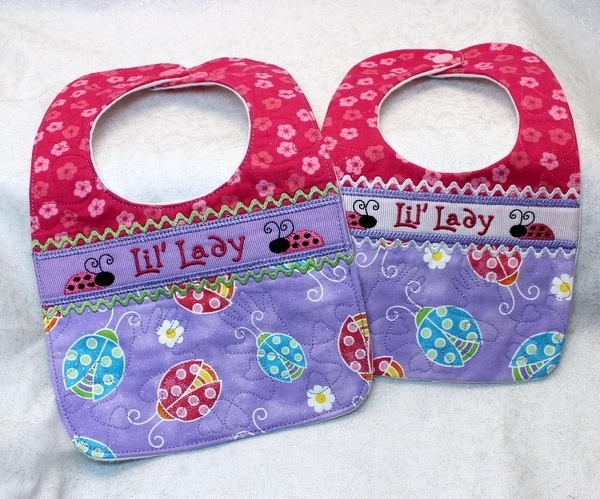 Both the plain and decorated bibs come in the 6x10 and 7x11 sizes. There are a total of 4 stitch files in this set. Please check your hoop sizes carefully. Bathtub Applique, 2 Sizes - Bonus Ducky!